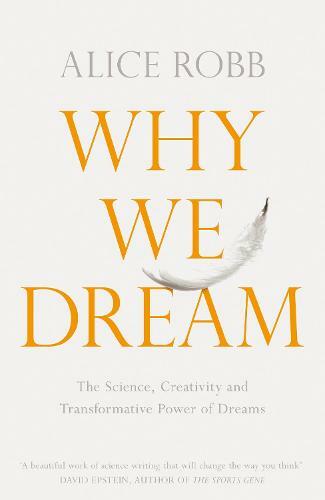 Waterstones TCR are delighted to welcome leading science journalist Alice Robb as she talks about her highly-anticipated new book, Why We Dream, at a very special event hosted by Natasha Devon. - Drug addicts who dream about drug-taking can dramatically speed up their recovery from addiction. Robb also uncovers the fascinating science behind lucid dreaming – when we enter a dream state with control over our actions, creating a limitless playground for our fantasies. And as one of only 10 per cent of people with the ability to lucid-dream, she is uniquely placed to teach us how to do it ourselves. With incredible new discoveries and stunning science, Why We Dream will give you dramatic insight into yourself and your body. You’ll never think of dreams in the same way again. The evening will include a chat with Alice, an opportunity for audience questions, and a book signing. Tickets are £7, or £20 including a copy of Why We Dream. Alice Robb is a leading science journalist who has written for The New Republic, New York, The New Statesman, The Atlantic, Elle, Foreign Policy, The Washington Post, Vice, The BBC and British Vogue. Why We Dream is her first book. Natasha Devon MBE is a writer & activist. She tours schools and colleges throughout the UK, delivering talks as well as conducting research on mental health, body image, gender and social equality.